KBC Bank Ireland said influences such as the EU summit on Ireland’s bank debt, the ECB rate cut and the latest Troika review likely impacted on sentiment. 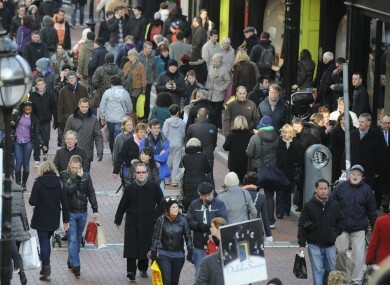 LAST MONTH SAW the strongest consumer sentiment reading since June 2010, according to the KBC Ireland/ESRI index for July. The figures revealed a sharp increase in the index from 62.3 in June to 67.7 last month. The three-month moving average also rose to 63.7 up from 55.9 in the same month last year. (These numbers refer to a measurement used for consumer activity – the historical average is 86.8 so this gives you an idea of where consumer sentiment is in these recession-hit days). The ESRI said consumers were notably less concerned about the general economic outlook and were more upbeat about their present financial situation although the index still remains well below the historical average of 86.8. The index of current economic conditions rose to 84.7 in July from 81.4 in June, representing the highest reading in two years. Hughes added that the improvement in Irish consumer sentiment in July is at odds with the trend seen in similar measures for many other countries in the same month. Email “Consumer sentiment in July strongest in two years”. Feedback on “Consumer sentiment in July strongest in two years”.